If you'd like to help support EasyPianoStyles.com and our free newsletter eNotes, please consider making a Donation. Thank you so much for your support! We'll keep those free lessons coming your way in 2018! Think You've Got to Start With Beginner Method Books? No Way. Here's the Forbidden Cure. It's Piano Made Easy! And Traditional Classical Teachers Don't Teach This Approach. You Defintely Want to Learn It! Play it Now and Read It Later! Debbie's students have go on to perform in Disney and nationally-acclaimed a cappella groups, orchestrate music on Broadway, and have been nominated as Best Collegiate Singer in 2009. Hello. Debbie Gruber here and here is my story. When I was in high school, I had been taking classical piano lessons for nine years. I really loved my teacher and enjoyed playing Mozart but I always felt something was missing and I yearned to play by ear and to play popular music. Well, one day, when I was a senior I wandered into the chorus room at Lexington High School (in Lexington, MA)during lunch hour and there was a girl sitting there playing the piano. She wasn't just playing, she was having a ball! I was so jealous. She wasn't using any music! She was improvising on chords, playing the blues, playing popular music and just having a grand old time. This is what I wanted so much to be able to do but my beloved teacher didn't know how to teach me. So I then found out about a teacher at a local music school in Boston who played jazz. I set up a lesson with him. I went to his studio, paid him $50 and the lesson lasted 20 minutes. He gave me a piece of paper and just dictated numbers to me that he wanted me to write down. I had no idea what these meant and he obviously wasn't interested in explaining them. Needless to say, I never returned. Frustrated that the jazz teacher wasn't interested in explaining anything to me and that my own classical teacher didn't have the pop/jazz background to help me, I gave up on my dream of learning to play popular piano. 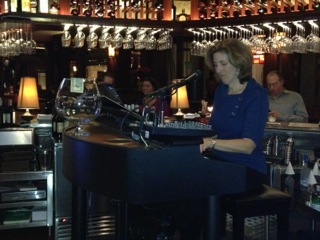 I found a man in Western Massachusetts who played piano in a piano bar every night. He liked to teach and he enjoyed the company during the day. Finally! This was the beginning of my journey into playing popular music. I soaked up all of the information he so generously gave me - chords, voicings, songs, embellishements, and I practiced and practiced. I then went on to study music, get a Master of Music degree from Western Michigan University, teach high school, perform,author books on playing the piano, operate a vibrant music school in Boston and start this website to help people learn how to play piano the fun way! Do you know that you CAN learn to play a song on the piano with NO PREVIOUS LESSONS, with both hands, in one hour by playing this way? It's absolutely true and I teach this method everyday. I have been teaching this non-traditional method for fourteen years now at over twenty-five adult education centers and colleges. And I teach my classes often four times a year at the same location because the class is so popular! quickly while having a lot of fun to boot! It's all about the chords. Let me repeat that with bold capital letters. I can show you how to accompany yourself singing. Or you could accompany a group sing-a-long or play in a band. Imagine having a party where YOU are the entertainer. It can be done. I promise you. How do I do this? What will bring you to this musical gratification and joy? 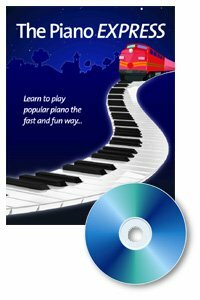 The Piano Express Book and CD program is your vehicle to the land of playing popular music. I use it in hundreds of classes and it works. WWW.EASYPIANOSTYLES.COM SERVES OVER 23 STATES AND 8 COUNTRIES WORLDWIDE!! **Stop buying sheet music for $3.95 a song. Develop your own arrangements. It's a much more creative approach to playing the piano! You design how you want to play a song. This program shows you how. **Learn a very easy trick for figuring out what "key" you are playing in. Then learn the predictable chords that will go with that key. This accelerates the learning process ten-fold. **Tricks for reading a melody line with your right hand, even if you don't know all of the notes yet. Focus on the intervals (you'll learn what those are) and what that means to your right hand piano playing. **No more the bass clef! Everything is melody line and chord. Takes the pressure off all of that tedious note-reading. It's worth the $25 investment. Try The Piano Express RISK-FREE for 90 Days. This is our guarantee to you. You can easily get a refund if you are not 100% satisfied! I stand totally behind this program that took one year to launch and of which I am very proud. I know it can help you make the kind of music you want to make at the piano. 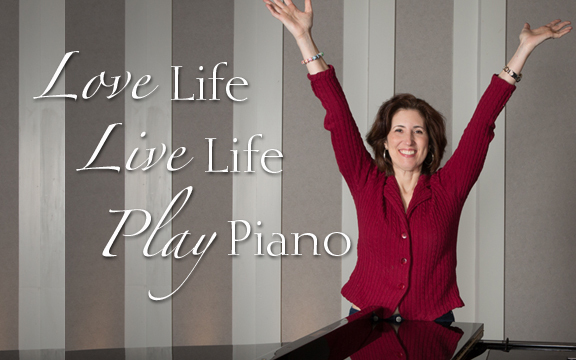 Let piano playing bring years of joy to your life finally. And now check out EasyPianoStyles.com's Facebook Page and become a friend!